One of the most tragic episodes of World War II was the Siege of Leningrad. RT interviewed two survivors who lived through the blockade as small kids. Seventy-one years on, both still shed tears as they recall the dark days. What unites and sticks in the memories of siege survivors – who lived through the ordeal for 872 days – is the precise amount of bread allocated – 125 grams per day. Whole families had to live on foodstuff that contained “a maximum of 30 percent of bread, or flour – the rest being residue, cellulose or flour dust”. The city saw terrible, famished days and widespread losses of life. On top of the lack of food, which resulted in all living things, including crows, cats and dogs being eaten by desperate residents, the sanitary conditions also suffered greatly. German air attacks destroyed civil infrastructure, water and sewerage systems, so that people were even pouring waste out of windows. “There was no water, it had to be fetched. My mother found a pair of my dad’s boots, for instance, and cut them into thin strips, as before the war boots were made from genuine leather, like pigskin. And she’d use these strips to make soup,” Ivanova recalled. Her mother risked her life going to the front line to collect oats that had not been harvested, “with the bullets from both sides flying over her head.” As her baby sister was dying, their grandmother warmed her up with a woolen glove and managed to make a drink with tea and grains of sugar – which were nearly impossible to find – saving her life. 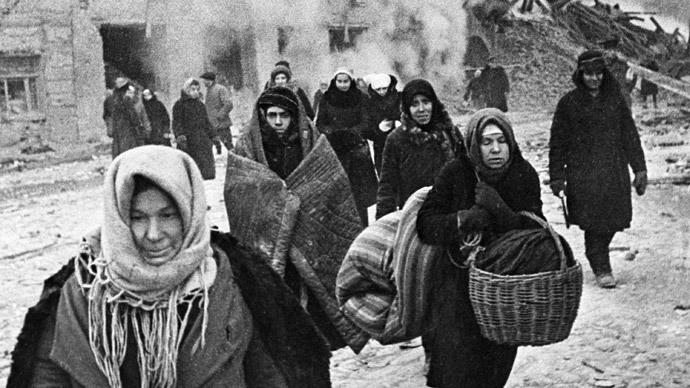 The Siege of Leningrad, one of the longest and most vicious in history, lasted 872 days, from September 1941 till January 1944, leaving over one million civilians dead.